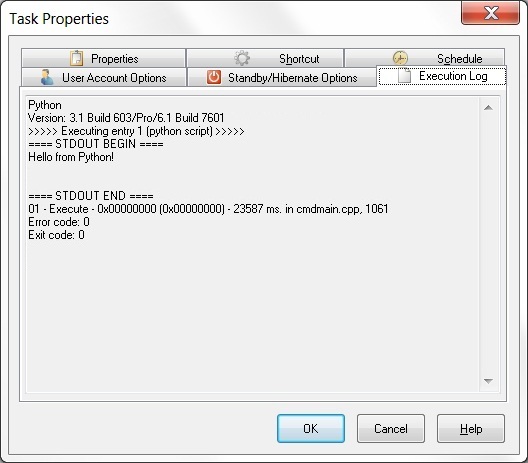 Python scripting in Advanced Task Scheduler | The official site of Advanced Task Scheduler software. Advanced Task Scheduler comes with internal portable Python interpreter. 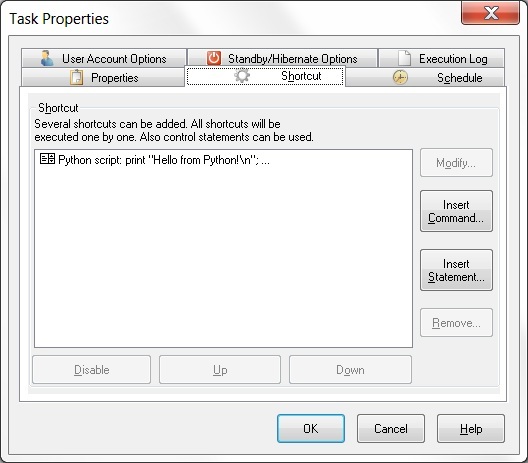 You only need to install Advanced Task Scheduler, create a Python script task and use all Python scripting power. For portable Python the filename.py file must be located in the current directory or in a directory listed in the Additional library path option in the Scripts section of the Preferences window. For installed Python the filename.py file must be located in the current directory or in a directory listed in the PYTHONPATH environment variable. Where commander is file name and path to the Command line tool: advscheduler_commander.exe, advscheduler_procmd.exe (Professional Edition) or advscheduler_netcmd.exe (Network Edition). Command line described in the Command line tool topic.